The federal government's fish preservation plan may not do much for fish but it's going to make a bunch of money for the lawyers, expert witnesses and activists. The Fisheries branch of the National Oceanic and Atmospheric Administration releases its formal plan to sustain Snake and Columbia rivers' salmon and steelhead runs. NOAA's plan walks through its preferred options of improving fish habitat, controlling harvest, improving hydro operations and breeding fish through hatcheries. While fish numbers are up from two decades ago when the runs fell under the protection of the Endangered Species Act, there's the fear that as soon as ocean conditions become hostile, the populations will crash. So fish advocates head back to federal courts, where the proposal -- technically known as a biological opinion or a biop -- is struck down as insufficient. Then NOAA goes back to the drawing board and reinvents the same old tactics. This cycle has played out four times in U.S. District Judge James Redden's courtroom. The process is one reason fish recovery has cost more than $10 billion. Now NOAA has issued its fifth plan. It differs little from the earlier versions. And it sounds like fish advocates will send this biop before Redden's successor, U.S. District Judge Michael Simon of Portland. For instance, Nez Perce Tribal Executive Committee Chairman Silas Whitman told the Tribune's Eric Barker the latest installment is "fatally flawed." If past is prologue, Simon will follow Redden's precedent -- and we'll be on our way to yet a sixth rendering. Why would anyone keep this up where there's every reason to be optimistic about making a deal? Since Redden's 2006 order, the federal dam complex has been directed to send more water over the spillways between May and August to enable smolts to migrate to the ocean. The results have been encouraging -- so much so that fishery scientists last spring suggested increasing spill to levels just shy of where nitrogen levels in the water can cause fish to get the bends. During a test period of five to 10 years, they're betting the smolt-to-adult return ratio -- now less than 1 percent -- could exceed 2 percent. 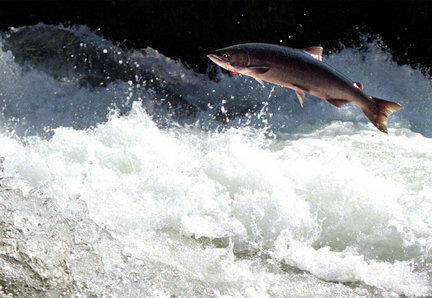 At that rate, the Northwest Power and Conservation Council believes fish survival, if not recovery, could be assured. Yet NOAA's biop takes the wrong direction. It would curtail spill in August, a low-water month when it's most critical. And it would barge more steelhead smolts in the spring. Likewise, there's been talk for almost two years of breaking the legal stalemate and going to the conference table. NOAA launched what it called an assessment of collaboration. It hired independent researchers to interview more than 200 stakeholders on all sides of the dispute. Compiled by the William D. Ruckelshaus Center and Oregon Consensus, and released last month, their report found "... the people of the Columbia River Basin share a common desire for recovery of these iconic species. While there are differences about how best to define and achieve recovery, this underlying desire is an important foundation that should not be lost in the tangle of bureaucratic complexity, litigation and scientific uncertainty." If NOAA has plans to pursue this opportunity, there's no sign of it in the latest biop. The feds already know what lies ahead. They've traveled this path many times before.